Curmudgeonly & Skeptical presents Boned Jello: Maybe we can have, like, a nuclear war and then we get a real course correction. Maybe we can have, like, a nuclear war and then we get a real course correction. "I remember 2006," Steyer said. "What happened is that George W. Bush, he put us in two disastrous wars and we were headed toward the biggest financial disaster since the Great Depression. So if the answer is that we need those three things to happen for a course correction, I'd prefer to move a little quicker. How about that? But I take your point. Maybe we can have, like, a nuclear war and then we get a real course correction." Steyer lives in Kalipornia, the first place in CONUS that Fat Kim could reach. 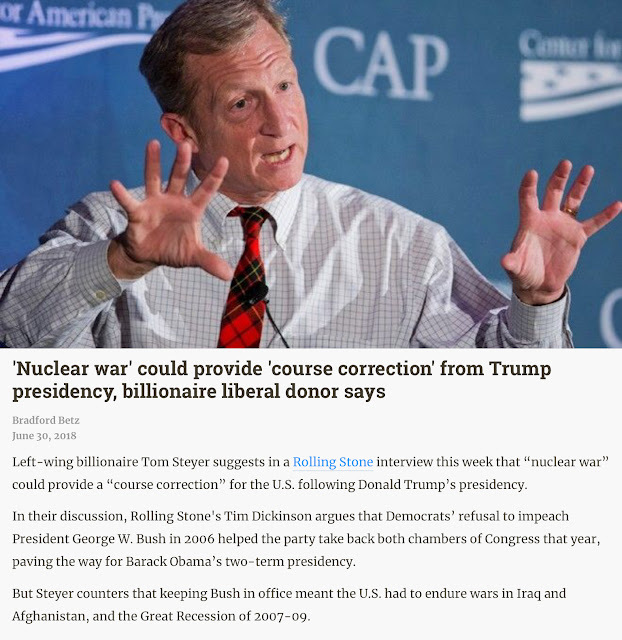 Kim nukes Steyer, Trump cruise missiles Kim, everybody's happy. For once, I think Steyer is right.